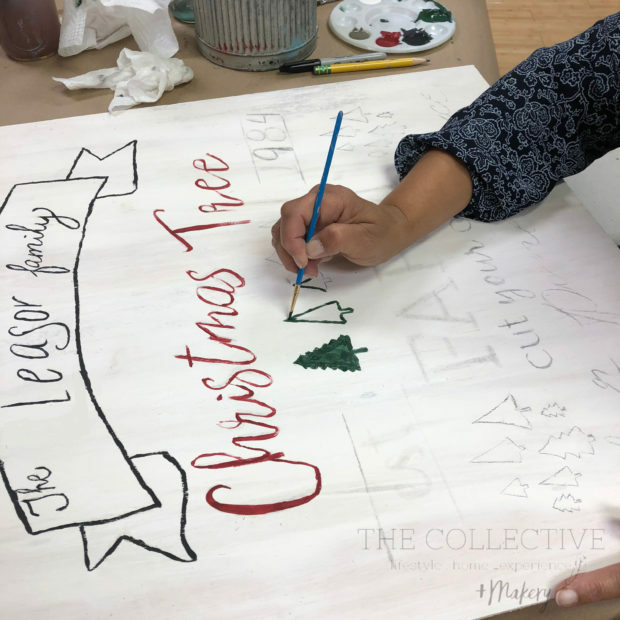 We very recently had a Christmas Tree Farm Holiday Sign Workshop at The Collective lhe in the Makery. It was so much fun, and everyone did such an amazing job with their signs! Like many of our workshops, we provide the artwork, supplies, and direction! We do the hard part, so that the attendees can do the fun part! I thought I would share a bit of the workshop with you. 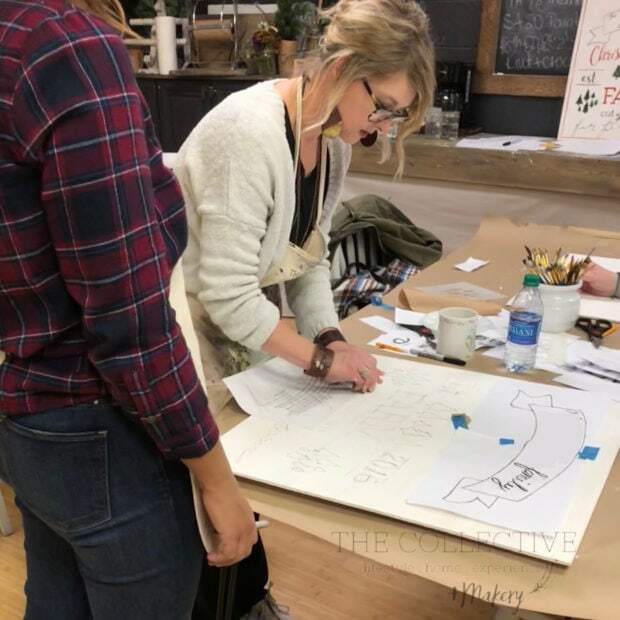 I love leading/teaching creative classes, and we had such a great time in our workshop. 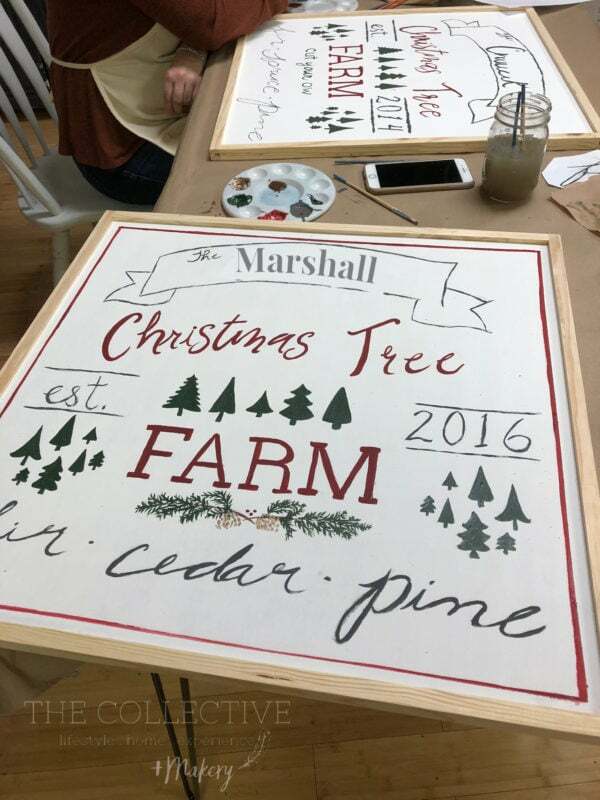 The participants had the option of an unframed, or framed custom boards,ready to paint. We had moms and daughters come together, sisters, and even best friends that came together to create in community. After everyone laid out their artwork, they transferred it, and then they were able to get to the fun part! 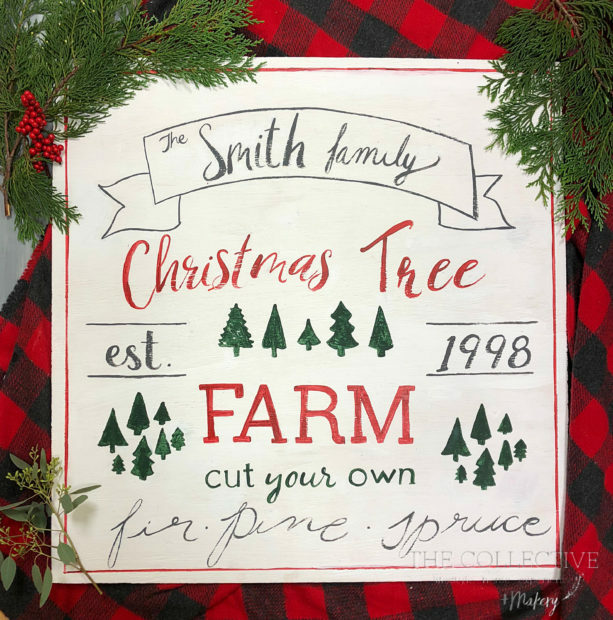 I was excited to see how their Christmas Tree Farm Sign Workshop was going to turn out! Even though it’s only the beginning of November, we cranked the holiday tunes and they painted away! I love how everyone starts with the same artwork, but every piece turns out so differently, but adding little custom bits . We also had the option for everyone to personalize their signs. Some people chose their last name, and other’s made it a little more informal. As well as custom artwork, we used some of the stencils from my Holiday stencil line at Royal Design Studios. 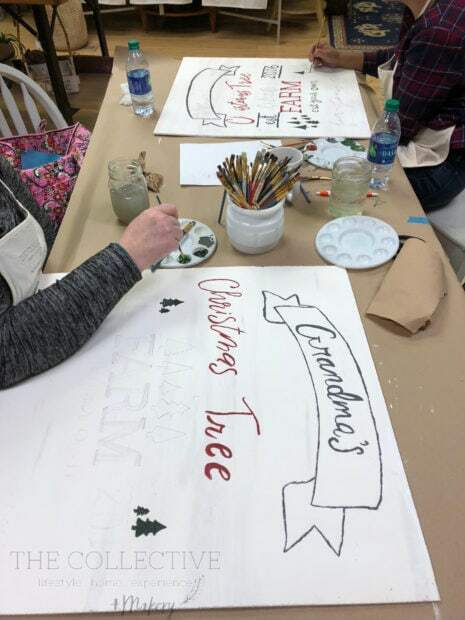 There are two different tree stencils that worked perfectly with the project. Occasionally, I step in to help here and there to lend a hand, but most of the time, everyone does a great job on their own. 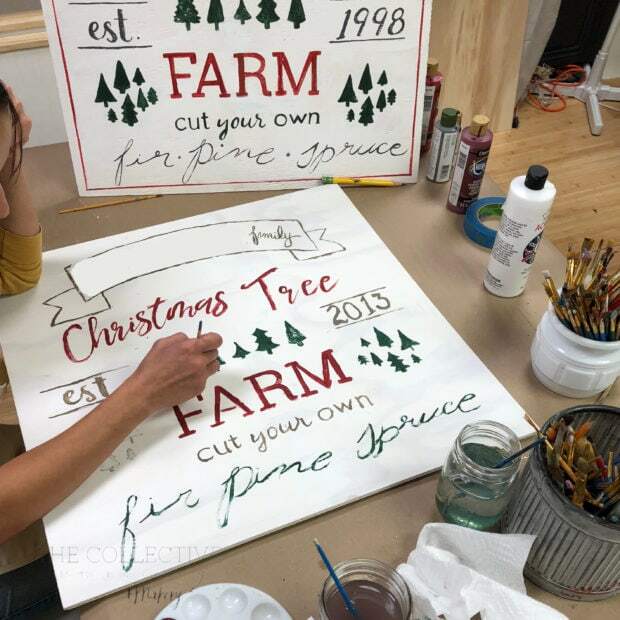 It was a fun DIY Christmas tree farm holiday sign workshop! We have fun December workshops coming up, and some really special events for the holidays. 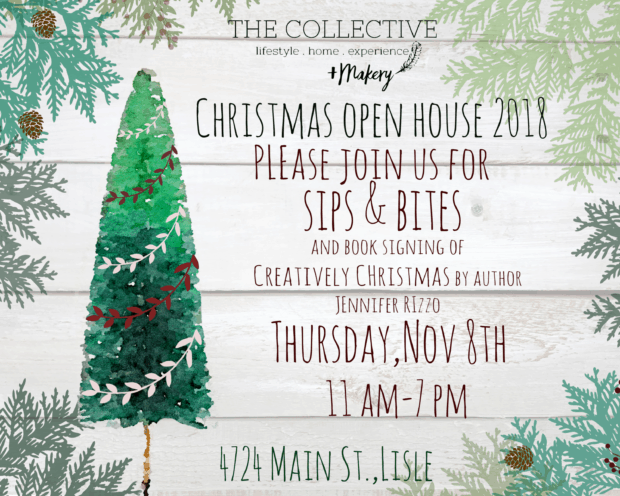 Our next event is our big holiday open house! book signing for my book Creatively Christmas! 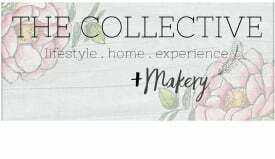 We are also going to be at The Three French Hens holiday market in Morris, IL. I hope you’ll join us for all of the fun and holiday cheer! 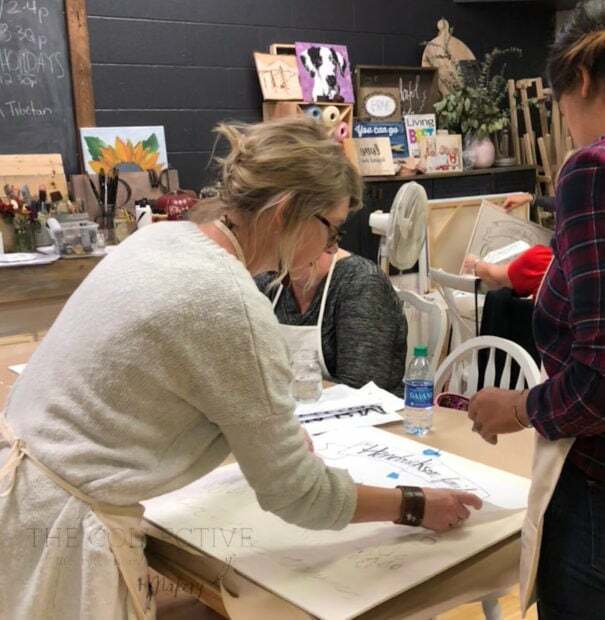 This looks like such a fun workshop, Jennifer! Wish we lived closer. 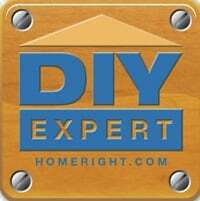 Enjoy your holiday home tour and book signing! Thank you Barbara, it was fun, and everyone did such a great job! I hope you had a nice Thanksgiving!